The Summit Children’s Touring Choir ended it’s 10-day 2007 iNCANTATO Performance Tour to Central Europe with an unforgettable concert in the stunningly beautiful St. Anna Kirche, in the heart of Vienna. Most tickets to the highlight concert benefiting the St. Anna Hospital’s Children’s Cancer Research Program were sold in advance. The choir directed by Arlene Jacobs had received impressive coverage in the Viennese press. Together with the walk-ins from all over the world, almost every seat in the church was taken, and the concert was a success for everyone involved. Proudly presented by the iNCANTATO Concert Management Team, the SCS Touring Ensemble impressed its audience in Austria with their inspiring selection of classic and modern works from Bach, Schubert, Schuman, Younger… and last but not least the audience’s favorite: “Rhythms of Life”. One very moved gentlemen in the audience, a singer himself, came up to the organizers afterwards to express special gratitude for the choir’s performance of the “Ave Maria”. The gentlemen, who was well into his sixties, stated that he had not heard this prayer performed in such a beautiful way since his late mother passed. 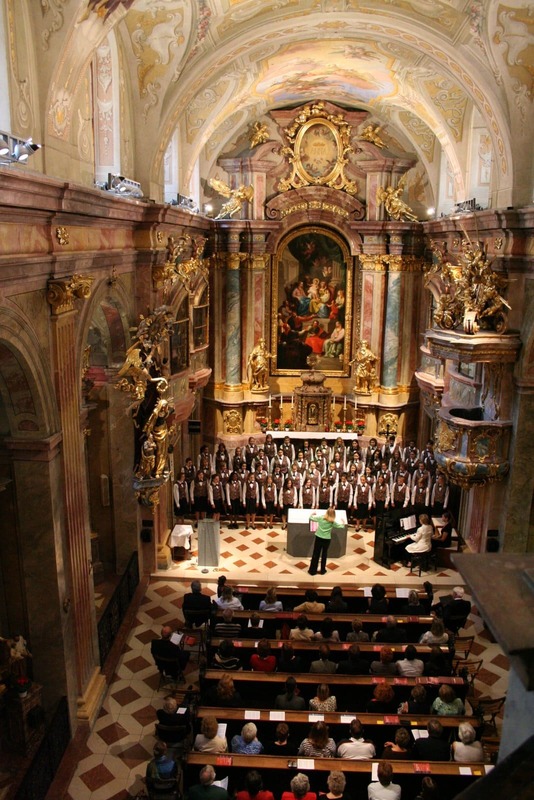 “I was actually praying while I listened to the choir sing it – what a wonderful concert, Dankeschoen”, he said. Below are two the videos of “Hosanna in excelsis” and “Rhythms of Life” taking during the final concert. After a fun farewell with Viennese burgers in the Prater, the choir took a ride on the famous ferris wheel before turning in for their last night overseas. On June 28, 2007, the Summit Children’s Touring Choir, their chaperones, friends and family, returned to Akron, Ohio.